In 1828 or 1829 Darby drew his ‘Prophetic Map’ (see JND Notes & Comments Vol 2 – page 192). The large migration of Eastern people to Europe, America and elsewhere, bringing the influence of religions such as Hinduism and Buddhism. I will treat the various areas of the world, citing Darby’s analysis and opinion and possible deductions. I have also noted a couple of things I do not understand. Doubtless this could be a topic for discussion. I might add that the church is not involved in this. However we Christians should be intelligent as to events in the world, and also know what will happen here after the church has been raptured. Of course we will not be here! Europe is primarily peopled with descendants of Japheth, specifically Gomer (Germany), Javan (Greece) and Tubal (Tiblisi? i.e. the Caucuses). However, with so much migration over the millennia, clear demarcations are impossible. Darby believed that France, not the USA, would become the dominant Western power. At the time France was in turmoil: Napoleon, whose objective had been European integration, had been defeated, and there was continued unrest up to the establishment of the Second Republic in 1848. France would not have been considered a potential leader of Europe at ay time during JND’s adult life, it being in trouble again in the 1870’s after the Franco-Prussian war. Darby foresaw European unity – at least as nation states working together, and that is what we have. At the time of writing Britain had just elected to withdraw from the European Union. Nevertheless, it will remain in the larger political/military grouping of NATO and probably the European Economic Area. However, it will not be in a position to lead Europe. Indeed, in Darby’s paper England is described as a minor irritant – this must have been perceptive considering the world dominant position of the British Empire in the 1800’s. Germany, whilst the largest economy, has never led, still being held back by the WW2 legacy. Hitler, another prefigurement of the Antichrist had thankfully been defeated. Darby referred to Austria. Of course this country’s influence has become minor since the fall of the Hapsburgs, and even more so since Hitler (an Austrian) annexed the country to Germany. It would remain part of the West European nations. He was also critical of Poland and to date the role of this populous nation has been limited to its part in the downfall of the Soviet system, and to providing the Pope in office at the time. Roman Catholicism will be the dominant religion, especially as so-called Protestant churches veer towards Rome. Elsewhere Darby made it clear that this would be increasingly so despite the strength of atheistic secularism. The large influx of Muslims, and those of Eastern religions will in time make way for the unified false Babylon religion. Already, in the UK, Muslims represent about 10% of the religiously active population, with Hindus, Sikhs and Buddhists making 5%. There is even a trend to pre-Christian paganism. Biblically the sphere of operations is the area covered by the Roman Empire and some extensions in Europe, Asia and Africa. Outgoings of Europe in the rest of the world – USA, Canada, Australia, Latin America etc., are not part of the sphere or provide leadership, but can be regarded as part of the expanded Roman Empire in Revelation. Did Darby foresee the modern advances in technology and its impact? He saw the improvement in communications and was not ignorant of scientific thought. What is clear from his writings is that he relates a lot to the influence of the East, embraced by the West. So it is not impossible that France will be the dominant Western force, supporting Darby’s prediction that the Antichrist would come from that country, despite all that has happened in the last 200 years. Who knows? Darby was quite specific as to this area, drawing on Ezekiel and Daniel in particular. On the European side we have Russia, referred to in prophecy as Rosh and Meshech (Moscow?) and Tubal. He thought that Russia would come to dominate Turkey-in-Asia, but I believe that if it does, it will control the whole country. Istanbul is as much Turkey as Ankara. This is not impossible. Whilst Turkey has been a member of NATO for decades, and would like to join the European Union, there are areas of tension with NATO and strong resistance to its joining the EU. Like Russia it does not really have democratic government. Having lost the Eastern European countries to the EU after the fall of communism, there is little doubt that Russia would like to extend its sphere of influence. Russia’s influence and control would then extend from the Arctic to the Mediterranean. The other area that Darby thought that Russia would dominate (though not control) is that of Persia (Iran) and Media the Japhetic children of Medai . [Darby said that that Persia was a subservient Hamitic people, but their language does not bear this out. Probably he was referring to what we now know as the Iraqis who speak Arabic, but would have been, like the Canaanites, descended from Ham – Sosthenes]. Darby’s map shows this area extending eastwards as far as the Indus River, and therefore embracing a lot of Pakistan and Afghanistan, and south to include Syria and Lebanon. Although those countries are mostly Sunni, Iran would like to control all the Muslim regions in that part of the world. Significantly Islam is hardly mentioned in JND’s writings – just four passing references to the religion or to Mohammed. Any review must take account of the increased profile of this religion, its divisions and the violent actions in its name. He never referred to the two opposing Sunni and Shi’ite divisions of that religion. The Shi’ite religion, with its observance of shrines and icons is probably more compatible with Orthodox Christendom, so there is a natural fit here. The Assyrians are referred to a lot – basically the same people. Finally, in this group are the descendants of Nimrod, the hunter. These Hamites led to the Huns and the Magyars, now occupying Hungary and much of the Balkans. Russia would have to wrest these countries from the EU and stop Serbia and the Ukraine from joining. The area ‘between the two rivers’ (i.e. 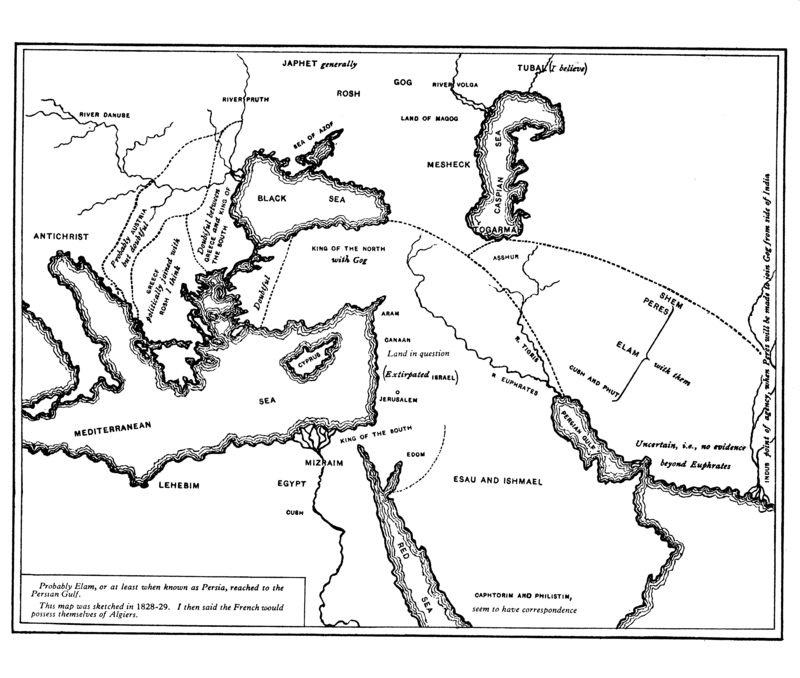 the Euphrates and the Nile) is occupied by descendants of Shem and Ham. Ishmael (Arabs) and Hamites – from Cush, Phut and Mizraim (Egypt and North Africa) are generally stricter, puritanical Sunni Muslims rivalling the Shi’ites to the north. Doubtless due to financial relationships with the West, Darby’s words could be fulfilled, ‘Eastern descendants of Ham, just as the western or southern descendants of Ham will be at the steps of Antichrist or the mature apostate body, for they will be judged as Antichrist, Gog and Magog, for coming against the Jews.’ (See original paper). Previous Brexit – What does it mean? Your article on JND’s prophetic map and your comments were noted with great interest. One could get into pages of comments as well but will try to keep to a few basic remarks in reply to your comments about what has happened since then. The European union and the United nations as a background perhaps for the new world order preparing for the beast and the false prophet. As JND indicates perhaps the gentile Antichrist will arise out of France or (one’s thought) out of Germany. Interesting that both Napoleon and Hitler had messianic visions of a united Europe, sort of a forerunner of the Antichrist. JND’s comments on Isaiah 18 interesting in relation to The U.S. and Britain’s support of Israel in 1947,8. As you say modern technology making preparation for the Antichrist ( Daniel 12:4,) so current today. The green movement as the political move pointing to “ those that dwell on the earth” in Rev. JND said these would be the supporters of the Beast, interesting. The mixing of religions in the movement of peoples. making way for the unified false Babylon religion. Amazing also how accurate JND was in his comments that in many cases are “up to date”. especially Gog and Magog. JND, Dennet and other old worthies seem to have the timing right there. Like your thought of how we should be interested in God’s people. Our main interest in the Mystery/Assembly, but as ’New Covenant Ministers” we should keep God’s beloved people in our thoughts. We often say in Calgary the we are custodians/ caretakers of the Hopes of Israel.